The Buddha Sakyamuni was born in Lumbini, Nepal as prince Siddhartha in 563 B.C. and lived to be 80 years old. As a young man, Siddhartha left the pleasures of royal life in search of an end to the miseries of existence. After quickly perfecting the meditation practices taught by the most advanced teachers of his time, Siddhartha realized that enligthenment could not be attained by extreme methods of asceticism or by achievement of concentration states. By practicing the middle way of gently examining the nature of his own mind he attained Buddhahood, the enligtened stage. 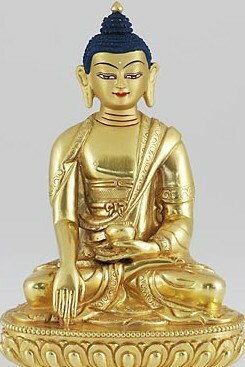 The historical Buddha Sakyamuni, gave many different kinds of teachings in order to accommodate the different capacities of beings. All these teachings can be divided into two catagories of the Sutrayana and the Tantrayana. Although the Buddha gave oral teachings, his early disciples recorded his instructions in writing and thus passed them on in this original form. Buddhist masters also authored many treatises that explain the Buddha’s teachings. The emphasis was on the authentic and accurate transmission of the teachings, as this is of prime importance. Throughout the centuries, as disciples became teachers in their turn, different lines of transmission came about, each with their own characteristics. Buddhism in Tibet includes all the teachings that originated in India. Through the effort of Tibetan translators and Indian masters the whole corpus of the Buddhist teachings was translated into Tibetan. With this foundation, Buddhism flourished in Tibet until the middle of the 20th century. In the 8th century the Tibetan king, Trisong Detsen, invited two Buddhist masters, Guru Rinpoche and Shantarakshita, to Tibet. At the same time the king had important Buddhist texts translated into Tibetan. This early activity of teaching and translation gave rise to the Nyingma tradition, the “Old Tradition”. The teachings in the Nyingma tradition are based on the texts of this early period of translation. Durung the 11th century there was a second period of translation which involved the revision of earlier terminology as well as new translations. The traditions that base their transmission on that period are referred to as the Sarma traditions, the “New traditions”. Of these, the Kagyu, Sakya and Gelug are the best known. The Kagyu tradition was introduced to Tibet by Marpa the translator, who emphasized four special transmissions that trace their origin to the Indian siddha Tilopa and other Indian masters of the Mahamudra lineage. The Sakya tradition was founded by Khon Konchog Gyalpo who focused his transmission on the teachings expounded by the Indian Mahasiddha Virupa. The Gelug tradition was established by Tsongkhapa who stressed the teachings of the Kadampa school founded in Tibet by the Indian master Atisha.